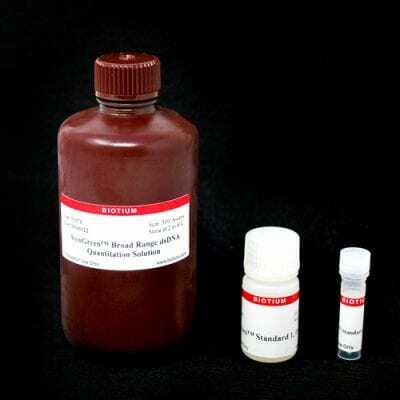 The AccuGreen™ Broad Range dsDNA Quantitation Kit is designed for use with handheld fluorometers such as the Qubit® fluorometer from Thermo Fisher. The AccuGreen™ kit is specific for dsDNA, and can quantify DNA samples in the range of 0.2-100 ng/uL. AccuGreen™ Broad Range Quantitation Solution also is available separately (catalog no. 31070) for customers who wish to use their own DNA standards. 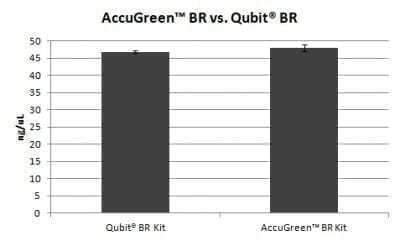 A genomic DNA sample was quantified using both the Qubit® BR kit and the AccuGreen™ BR kit. A nearly identical result was obtained with each kit.